Aliens Conspiracy theory Government Science Technology Flight MH370 conspiracy theories: what would have happened to the missing plane? Flight MH370 conspiracy theories: what would have happened to the missing plane? IN THE absence of any firm evidence about the fate of missing flight MH370, the world's conspiracy theorists have weighed in with explanations of their own for the Malaysian Airlines plane's disappearance. Last week the Malaysian opposition leader Anwar Ibrahim, accused his country's government of withholding "missing bits of information" about the investigation. He asked how a country with "one of the most sophisticated" radar systems in the world could simply lose track of an aeroplane? Alien abduction Five per cent of Americans surveyed by Reason.com believe that the plane was abducted by aliens. Some bloggers have pointed to a number of recent UFO sightings in Malaysia as evidence for extraterrestrial intervention. Alexandra Bruce, from Forbidden Knowledge TV, "proves" the involvement of aliens with her analysis of radar data. She claims that footage posted on YouTube shows the presence of something that "can only be termed a UFO" in the skies over Malaysia. Of course, that means something that is "unidentified" rather than aliens. The Bermuda TriangleOk, so the plane didn't actually fly anywhere near Bermuda, but some people – including one Malaysian minister – pointed out that the area where MH370 vanished is on the exact opposite side of the globe to the Bermuda Triangle. Unfortunately those people are wrong; the exact opposite side of the globe is closer to the Caribbean than Bermuda, The Sunday Times notes. 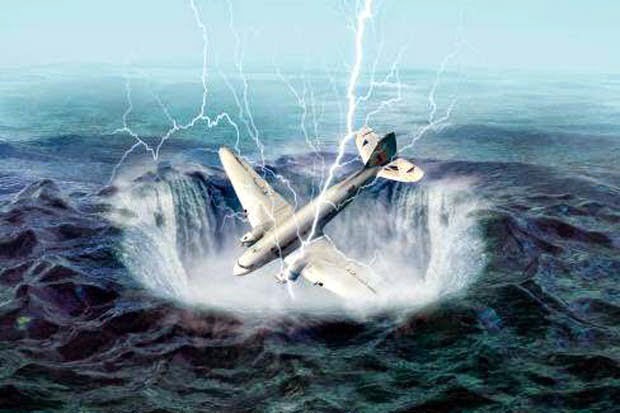 InvisibilityAccording to reports, 20 employees of Freescale Semiconductor, a company that develops "cloaking" technology were onboard the MH370 when it went missing. Some, such as the writers of WorthyToShare.com, have speculated that the plane may have been turned invisible and landed somewhere, possibly at the US Air Force base in Diego Garcia. A weapon of unimaginable powerWriting for NaturalNews.com, Mike Adams says that the plane's disappearance shows that "some entirely new, mysterious and powerful force is at work on our planet which can pluck airplanes out of the sky without leaving behind even a shred of evidence". If a weapon capable of making a plane disappear without trace does exist, then "whoever controls it already has the ability to dominate all of Earth's nations with a fearsome military weapon of unimaginable power", Adams writes. Quite concerning.